Our Pyramid Link Building Service is designed to give you formidable results with white-hat safety. By creating multiple tiers of links, and shielding your money site from any hint of link-building, we can divert the lìnk juice from THOUSANDS of websites all to you, safely and effectively. 50 nuclear 301 redirects hosted over Unique domains and Class C IP addresses. This helps in two ways. Gives you a SERP boost because you are getting a 301 'Vote' from 50's of different authority domains/IP's. 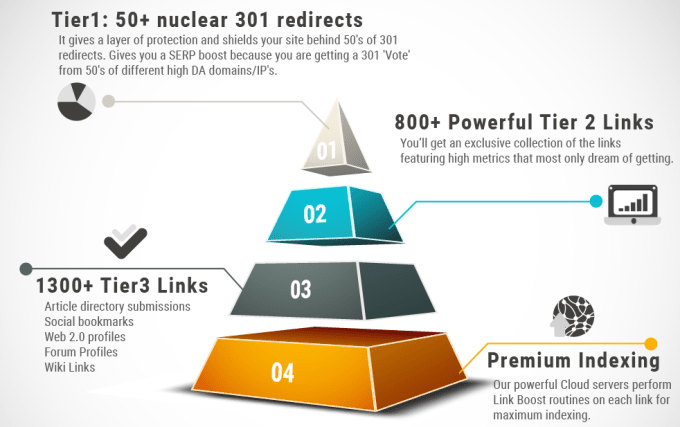 Create powerful and safe seo friendly link pyramid is ranked 5 out of 5. Based on 5 user reviews.